I can’t believe it! I finally did it! I am an OFFICIAL BLOGGER and a Lurker NO LONGER! I have wanted to start a blog for years, but I am the type of person that has to have all my ducks in a row before I jump in. I realize that this is both a positive characteristic and a drawback. But, I finally took the advice of many of the talented bloggers I have been following, and just did it with some of my ducks still running amuck! I have been a crafter and seamstress for a large part of my life and have enjoyed creating everything from pin cushions, to jointed teddy bears, home gift items to slipcovers. I have done dressmaking, women’s tailoring, and even a man’s suit, but my love today is quilting. I thoroughly enjoy the entire process, from picking the delicious fabrics all the way through to trimming and binding. Perhaps the best part is all the wonderful people I meet as I sew from Bobbin to Bobbin. 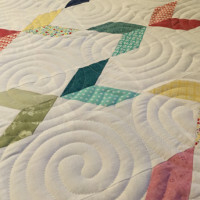 The main purpose for this blog is to document my journey as a professional longarm quilter. I invite you to join me. Hand holding is encouraged and welcomed! How about you? Do you have a blog and how long did you think about it before your first post or are you still thinking? I invite you to jump in with me! The water is fine! While they say imitation is the sincerest form of flattery, (and believe me, I am flattered), publishing without permission is not flattering or respectful. Please contact me for written permission before copying any photos, content, or blog posts from this website. Thank you! Copyright © 2019, Nora Dougherty. All Rights Reserved.